It has been a crude fortnight of ups and downs for oil futures benchmarks. Essentially, supply-side fundamentals have not materially altered. There’s still around 1.3 million barrels per day (bpd) of crude oil hitting the markets in excess of what’s required. Barrels put in storage are at an all time high, thanks either to those forced to store or those playing contango. US inventories also remain at a record high levels. However, the biggest story in the oil market, as well as the wider commodities market, is the strength of the US dollar. All things being equal, the dollar’s strength is currently keeping both Brent and WTI front month futures contracts at cyclical lows. The past five trading days saw quite a few spikes and dives but Friday’s close came in broadly near to the previous week’s close (see graph on the left, click to enlarge). In the Oilholic’s opinion, a sustained period of oil prices below $60 is not ideal for unconventional exploration. Nonetheless, not all, but a sufficiently large plethora of producers just continue to grin and bear it. While that keeps happening, and the dollar remains strong, oil prices will not find support. We could very well be in the $40-60 range until June at the very least. Unless excess supply falls from 1.3 million bpd to around 750,000 bpd, it is hard to see how the oil price will receive support from supply constriction. Additionally, Fitch Ratings reckons should Brent continue to lurk around $55, credit ratings of European, Middle Eastern and African oil companies would take a hit. European companies that went into the slump with stretched credit profiles remain particularly vulnerable. In a note to clients, Fitch said its downgrade of Total to 'AA-' in February was in part due to weaker current prices, and the weaker environment played a major part in the downgrade and subsequent default of Afren. "Our investigation into the effect on Western European oil companies' credit profiles with Brent at $55 in 2015 shows that ENI (A+/Negative) and BG Group (A-/Negative) were among those most affected. Both outlooks reflect operational concerns, ENI because of weakness in its downstream and gas and power businesses, BG Group due to historical production delays. Weaker oil prices exacerbate these problems," the agency added. Of course, Fitch recognises the cyclical nature of oil prices, so the readers need not expect wholesale downgrades in response to a price drop. Additionally, Afren remains an exception rather than the norm, as discussed several times over on this blog. Moving on, the Oilholic has encountered empirical and anecdotal evidence of private equity money at the ready to take advantage of the oil price slump for scooping up US shale prospects eyeing better times in the future. For one’s Forbes report on the subject click here. The Oilholic has also examined the state of affairs in Mexico in another detailed Forbes report published here. Elsewhere, a statement earlier this week by a Kuwaiti official claiming that there is no appetite for an OPEC meeting before the scheduled date of June 5, pretty much ends all hopes of the likes of Nigeria and Venezuela in calling an emergency meeting. The official also said OPEC had “no choice” but to continue producing at its current levels or risk losing market share. In any case, the Oilholic believes chatter put out by Nigeria and Venezuela calling for an OPEC meeting in the interest of self-preservation was a non-starter. Given that we’re little over two months away from the next meeting and the fact that it takes 4-6 weeks to get everyone to agree to a meeting date, current soundbites from the ‘cut production’ brigade don’t make sense. Meanwhile, the UK Treasury finally acknowledged that taxation of North Sea oil and gas exploration needed a radical overhaul. In his final budget, before the Brits see a General Election on May 7, Chancellor George Osborne cut the country’s Petroleum Revenue Tax from its current level of 50% to 35% largely aimed at supporting investment in maturing offshore prospects. Furthermore, the country’s supplementary rate of taxation, lowered from 32% to 30% in December, was cut further down to 20% and its collection at a lower rate backdated to January. Altogether, the UK’s total tax levy would fall from 60% to 50%. Osborne’s move was widely welcomed by the industry. Some are fretting that he’s left it too late. Yet others reckon a case of better late than never could go a long way with the North Sea’s glory days well behind it. That’s all for the moment folks! Keep reading, keep it ‘crude’! © Gaurav Sharma 2015. 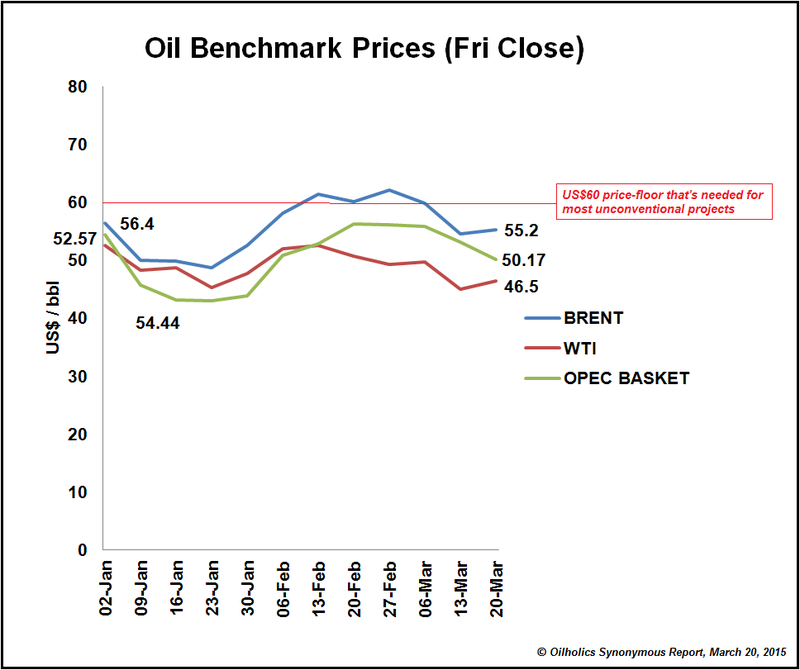 Graph: Tracking Friday oil prices close, year to date 2015 © Gaurav Sharma, March 20, 2015. Perceptions about massive a decline in US oil production currently being put forward with such fervour and the ground reality of an actual one taking place are miles apart; or should we say barrels apart. Assuming that a decline in production stateside would start eroding the oil supply glut thereby lending slow but sure support to the oil price is fine. But declarations on the airwaves by some commentators that a North American decline is already here, imminent or not that far off, sound too simplistic at best and daft at worst. The Oilholic agrees that Baker Hughes rig count, which this blog and countless global commentators rely upon as a harbinger of activity in the sector, has shown a continual decline in operational rigs over recent weeks and months. However, that does not paint a complete picture. Empirical and anecdotal data from Canada demonstrates that Western Canadians are aiming to do more with less. According to research conducted by the Canadian Association of Petroleum Producers (CAPP), fewer wells would be dug this year but production will actually rise on an annualised basis over 2015. That’s despite the fact that the Western Canadian Select fell to US$31 per barrel at one point. There’s a similar story to be told in the US of A, and digital disruptors at Drillinginfo are doing a mighty fine job of narrating it. The Austin, Texas headquartered energy data analytics and SaaS-based decision support technology provider opines that much of the current conversation obsessively intertwines the oil price dip with a decline in activity, bypassing efficiencies of scale and operations achieved by US shale explorers. “Our conjecture is that an evident investment decline does not imply that production is nose-diving in tandem. Quite the contrary, our research suggests exploration and production firms are 25% more efficient than they were three years ago,” says Tom Morgan, Analyst and Corporate Counsel at Drillinginfo. It’s not that Drillinginfo is not recording dip in rig counts and new drilling projects coming onstream via its own DI Index. Towards the end of February, its US rig count stood at 1433, while new US oil production dipped 9% on the month before to 525 million barrels per day (bpd). However, if what’s quoted here sounds better than what you’ve heard elsewhere then it most probably is for one simple reason. “What we put forward is in real-time. Two years ago, we started handing out GPS trackers to operators to latch on to their rigs. It was not easy convincing an old fashioned industry to immediately warm up to what we were attempting to do. It was a long drawn out process but we converted many people around to our viewpoint. “At present, over 80% of rigs in continental US are reported on daily via Drillinginfo installed GPS units. In return, the participants get free access to our collated data. At this moment in time, not only can I point out each of these rigs via a heat signature (see image from January above left, click to enlarge), but also pinpoint the coordinates for you to locate one, drive there and verify yourself. I’d say our data is 99% accurate based on back testing and reconciling trends with our archives,” Morgan adds. 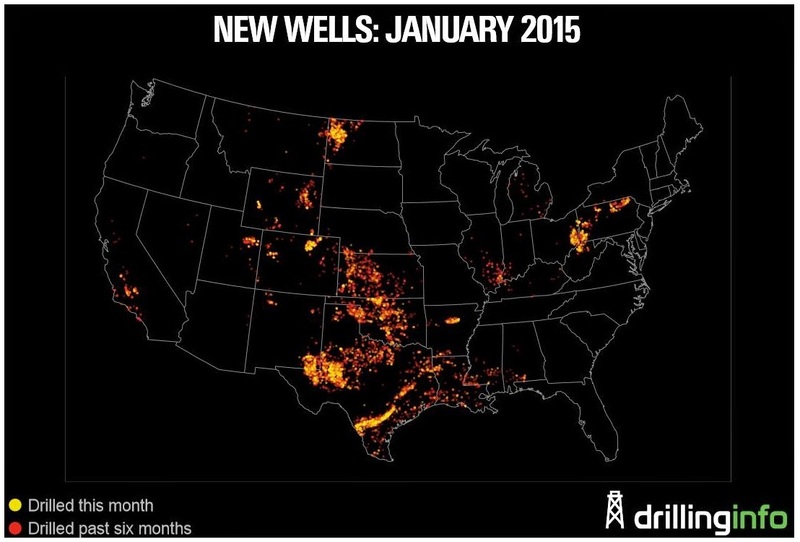 Drillinginfo saw a 24% decline in US permit application between January and February. This shows that investment is slowing down, yet at the same time operational wells are generally on song. With the end of first quarter of this year in sight, the US is still the world’s leading producer in barrels of oil equivalent terms. Oil production continues to rise, albeit not in incremental volumes noted over the first and second quarters of last year prior to the slump. US producers, or shall we say those producers who can, are strategically lowering operations in less bankable or logistically less connected shale plays, while perking up production elsewhere. For instance, while the collated production level at Bakken shale plays in North Dakota is declining, production at Eagle Ford shale in Texas has risen to 159,000 bpd; a good 26,000 bpd above levels seen towards the end of last year. In terms of the type of wells, Drillinginfo sees older vertical wells bear the brunt of the slump, while production at onstream horizontal wells is either holding firm or actually rising a notch or two. “No one is pretending that market volatility and the oil price slump isn’t worrying. What we are encountering is that shale players are trying to achieve profitability at a price level we could not imagine ten, five or even three years ago because technology has advanced and efficiencies have improved like never before,” Morgan adds. While pretty reliable, feed-through of information via the Baker Hughes rig count is not real-time but looking backwards based on a telephone and electronic submission format. By that argument, the Oilholic finds what Drillinginfo has to say to be an eye-opener in the current climate, particularly in an American context. However, company man Morgan, who has known Drillinginfo's co-founder and CEO Allen Gilmer since both their freshmen years at Rice University back in the 1980s, has a more polished description. That agility and sense of perspective is something the industry does indeed crave, especially in the current climate. The Oilholic would say what Genscape is bringing to storage monitoring; Drillinginfo is bringing to upstream data analytics. That’s all for the moment folks! Keep reading, keep it ‘crude’!